2 Totes to get you Out ‘n’ About in Style. 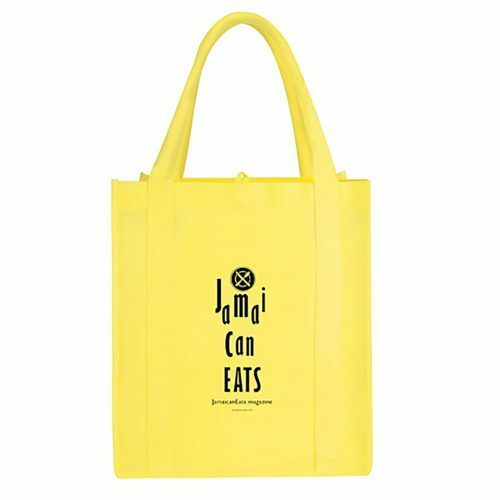 Be the envy of other shoppers when you take your Stylish JamaicanEats Grocery Tote Bag to the supermarket, grocery store or market. Roomy enough to stash your groceries, this ultra strong, reusable Tote has double 20 inch reinforced handles and a supportive bottom board. In addition to its good looks, it’s a great alternative to plastic bags. You’ll love this Snazzy 2-Coloured JamaicanEats Tote. Take it to meetings, school, shopping, or when you’re out and about and need a chic carryall. The webbed handles make for easy carrying and, made with polycanvas, it’s built to last for years to come. Bonus front pocket keeps your keys, badge, etc. within easy reach.